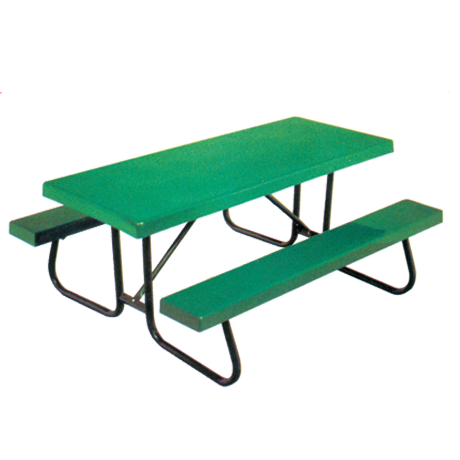 Here are picnic tables in a wide range of metal bases supporting the best top & seat materials to fit your application. The Shenandoah models are the strongest and very heavy. This makes them a good choice for county, state and national parks. 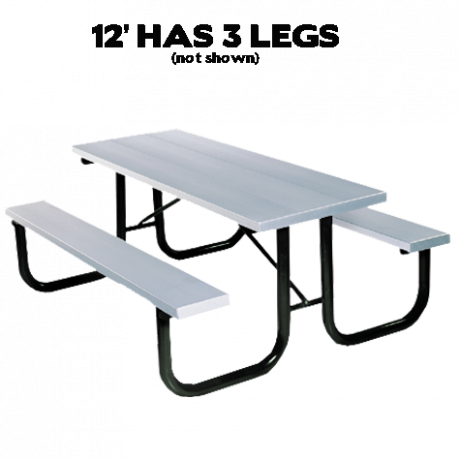 At the other end of the spectrum is the Cascade picnic table. It has a lighter weight metal tubing and bolt together design. 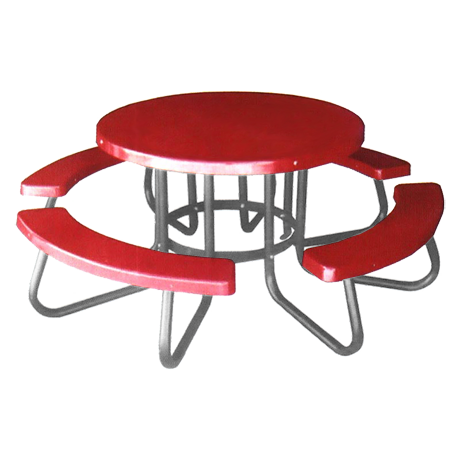 Cafeterias and outdoor dining areas that need to move the picnic tables for cleaning the floors benefit from this style's light weight. 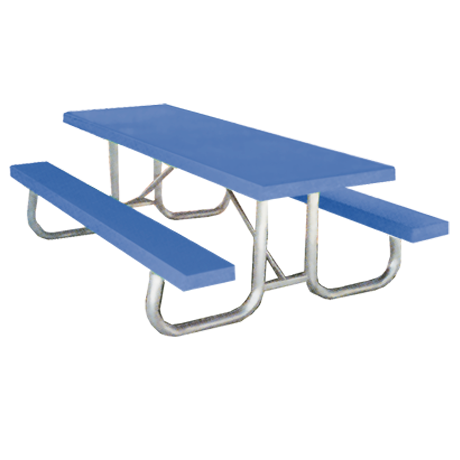 All of these commercial picnic tables with metal frames are made for public use and will stand up to the rigors of busy everyday use. 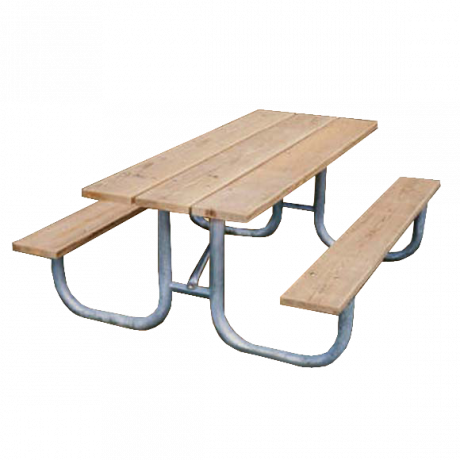 The galvanized steel frame design of these picnic tables guarantees a firm foundation and provides the additional ruggedness needed for life in a public picnic area! Two steel frame models are hot dip galvanized, the process of bonding a thick covering of molten zinc to the steel assembly. No other coating or treatment protects the steel and ensures its longevity as well as this process! 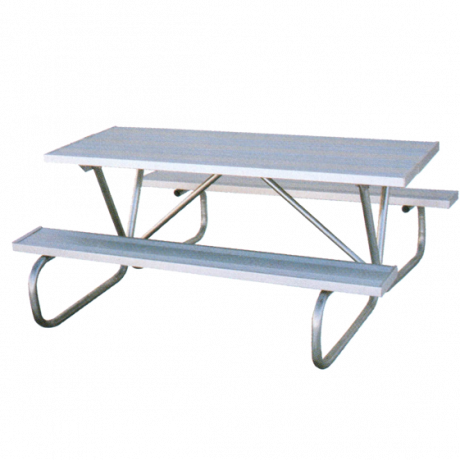 With four different metal frames and your choice of wood, aluminum, recycled plastic, or fiberglass planks, you’re sure to find the perfect steel framed picnic table for your picnic area needs! 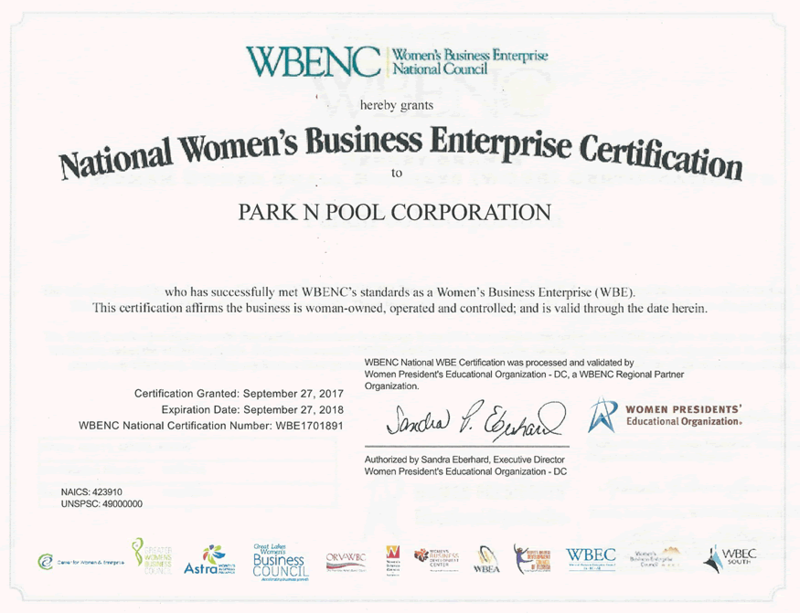 Treated pine planks combined with the Shenandoah steel frames have been a U.S. Park Service standard for more than 50 years! The 2" x 10" yellow pine wood planks are naturally long lasting and easy to repair. The New Wolmanized® L3 wood treatment has been recently developed to be non-toxic to humans (just bugs and rot). It is a waterborne low impact preservative. Because of this, it has won the EPA’s Green Chemistry Award for a wood preservative that is both safe and eco-friendly. 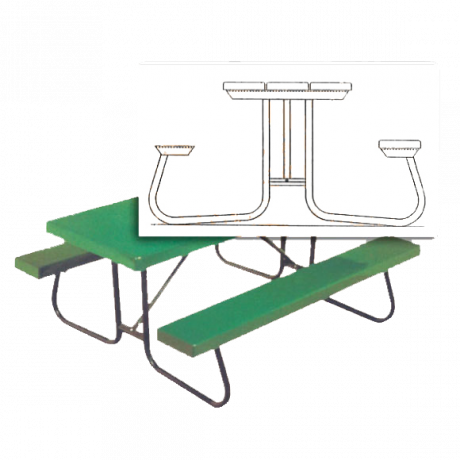 These outdoor tables are the perfect choice for picnic shelters. 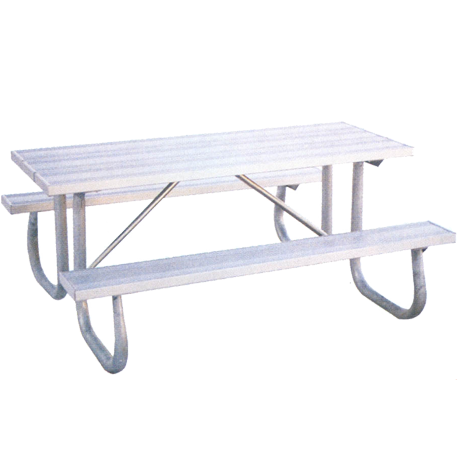 The marriage of aluminum planks with metal frames makes a tough, long lasting addition to any public picnic area. Virtually indestructible, yet light enough to be relocated when necessary-what could be wrong with that?!? The 2" x 10" extruded aluminum planks are anodized to keep them looking new for decades to come and the structural design of the planks is engineered to support enormous weights without bending or bowing. These same planks are used in our bleachers. Aluminum planks are naturally impervious to water and food stains. They can't burn so they become an ideal choice where flammability is a concern. 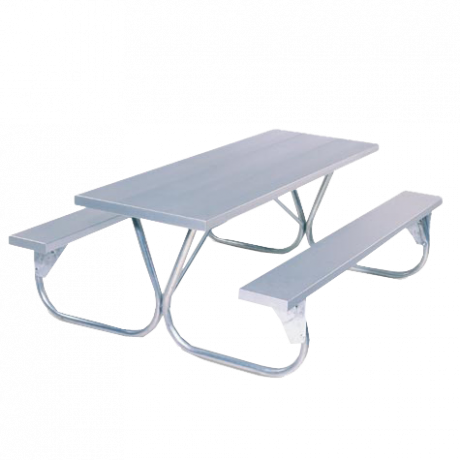 When portability and indestructibility are important, choose a steel framed picnic table with aluminum planks. One concern with aluminum planks is that they get hot in the sun, especially in southern climates. 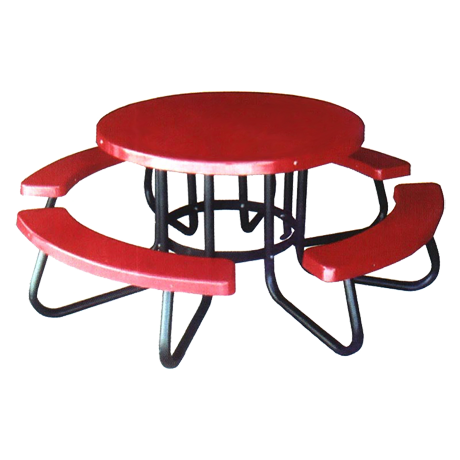 Recycled plastic top and seat planks, in combination with the metal frames, make these steel framed picnic tables virtually maintenance free! The non-porous nature of recycled plastic allows it to be easily disinfected, and most graffiti can be washed off with ease - deterring vandals and elements alike. Each 2" x 10" recycled plastic plank has a 1" x 1" steel tube embedded in the bottom surface to prevent the plank from ever sagging. After your tables have worked hard for 20 years, you can put the planks in the recycling bin to be used again – talk about renewable resources! 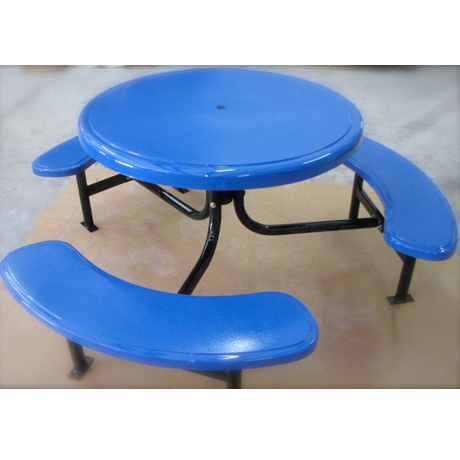 These fiberglass table top and seat planks are coated with an Ultra® Gelcoat providing an effective barrier against chemicals, abrasions, fading and moisture while also offering 200% greater gloss and color retention. 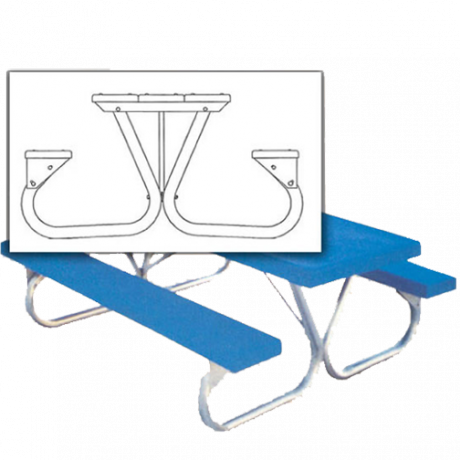 The smooth surface of the planks provides a comfortable, multi-use picnic table that also ensures bathing suits and clothes won’t snag! 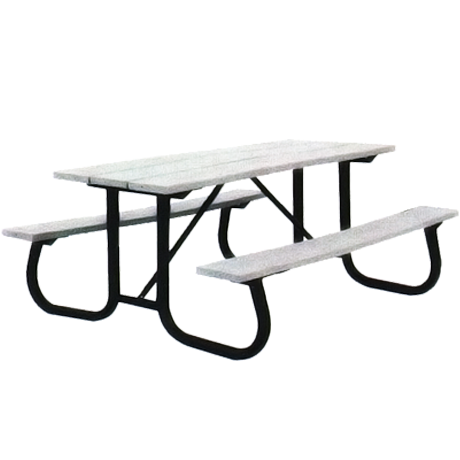 The solid surface top and seats make this steel framed picnic table easy to clean (there are no cracks between planks) Ideal for food courts and colorful outdoor areas. 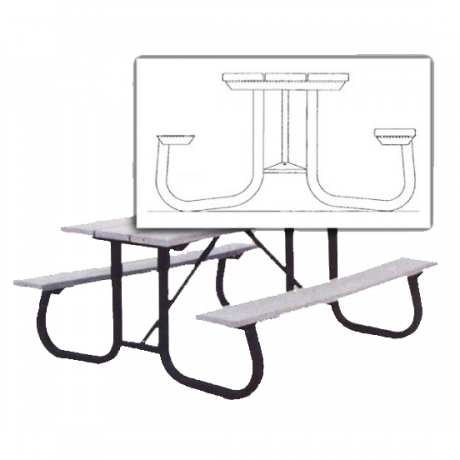 Do you want to build your own picnic table? 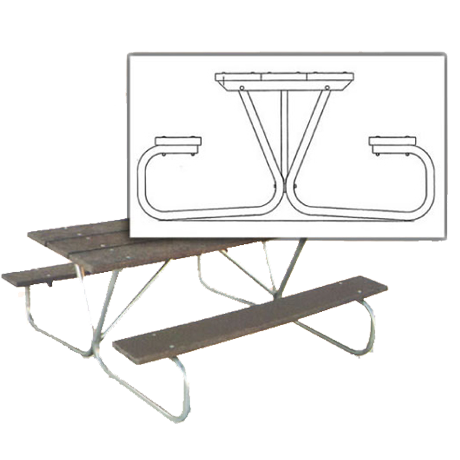 Visit our "Picnic Table Frames Only" page. Call and let our friendly sales staff help you determine the right planks for your picnic area. No matter what planks you choose, it’s still all about the steel!